← March 13, 2019 – OCB Presents a FREE CONCERT at Ohlone College in Fremont! 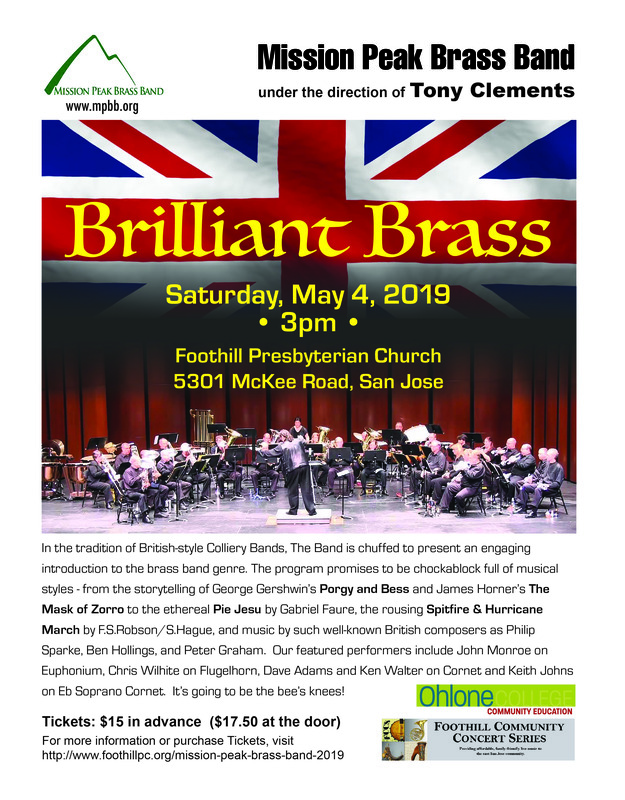 In the tradition of British-style Colliery Bands, The Mission Peak Brass Band is chuffed to present an engaging introduction to the brass band genre. The program promises to be chockablock full of musical styles – from the storytelling of George Gershwin’s Porgy and Bess and James Horner’s The Mask of Zorro to the ethereal Pie Jesu by Gabriel Faure, the rousing Spitfire & Hurricane March by F.S.Robson/S.Hague, and music by such well-known British composers as Philip Sparke, Ben Hollings, and Peter Graham. Our featured performers include John Monroe on Euphonium, Chris Wilhite on Flugelhorn, Dave Adams and Ken Walter on Cornet and Keith Johns on Eb Soprano Cornet. It’s going to be the bee’s knees! Tickets $15 in advance and $17.50 at the door. 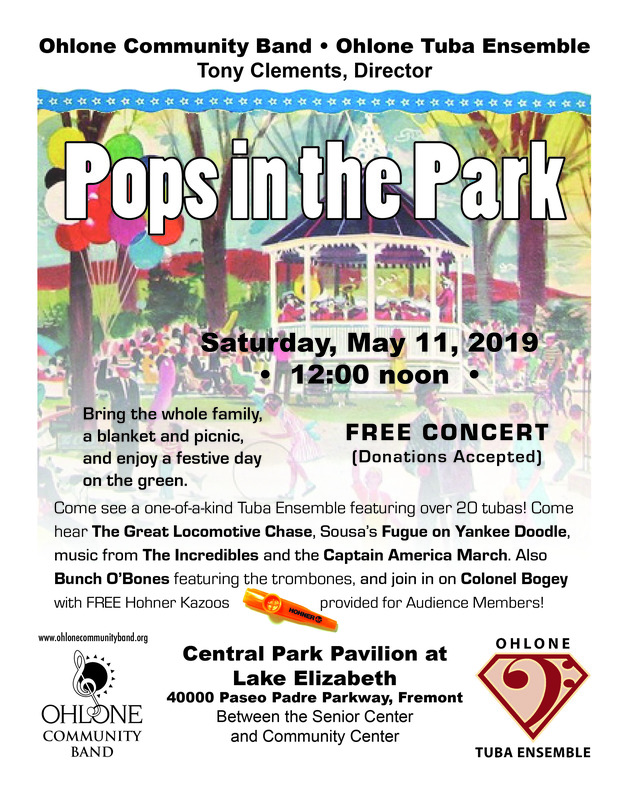 Come join the Ohlone Community Band and the Ohlone Tuba Ensemble as they present a FREE Concert in the Park. 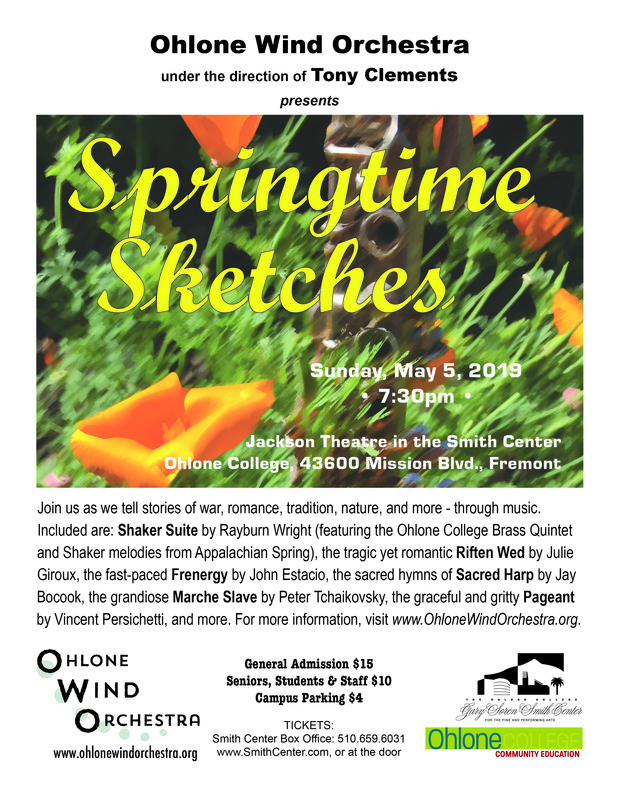 First will be the one-of-a-kind Ohlone Tuba Ensemble – featuring over 20 tubas! Then the Ohlone Community Band takes the stage, featuring such pieces as: The Great Locomotive Chase by Robert W. Smith, Captain America March by Alan Silvestri, Fugue on Yankee Doodle by J.P. Sousa, The Incredibles by Michael Giacchino, Ben Hur by Miklos Rozsa, Bunch O’Bones by Richard Fote (featuring the trombone section), and Colonel Bogey March by Kenneth Alford (with free kazoos provided). Bring a blanket, a picnic basket, and enjoy the music!